I have a bone to pick with anyone who lives from a place of scarcity. If you haven’t figured this out yet as a digital creative, you need to jump on the wagon: community is everything. What does that mean? First, even if our services overlap, we are unique. Each of us creatives slinging it on our own every day hold a specific space in this sphere if we take the time to determine what sets us apart. When you realize that there is more than enough success for all of us, life feels a whole lot lighter. The idea is that someone else’s success doesn’t dampen your own. In fact, we can build on each other’s success! We can support one another in growth; doing so actually promotes our own personal and professional growth. When we are self-aware and believe in the power of our community, we can be our own biggest fans and still find a seat at the top. Squinty eye giggles are the best kind of happy. Last weekend I was in Toronto and I had the absolute pleasure of meeting another copywriter. I’ve never met another copywriter in my entire career, so I was very excited to chat about our work. Not only was she super friendly and an expert on where the cutest coffee shops (and donut spots!) were, but she totally “gets it” working in the same field. Another example: Recently, you might have seen a few photos around my blog that are credited to Something Simple. I met Jenn (the owner) in a Facebook group and I’ve had so much fun getting to know her—usually over coffee and photo shoots. Then there’s Linsey of LJ Media House, my OG #bizbestie who I met on Instagram. We’re both members of the Bucketlist Bombshells, which led us to follow each other on Instagram. One day I slid into her DMs and now we chat nearly every day about all things business, shared client projects, and life in general. I’m so thankful for the support. A lot of us creatives who set out to do this thing on our own don’t have coworkers (aside from our pups) and life can get lonely when you work for yourself! Spending time with women who have similar lifestyles is refreshing, uplifting, and inspiring all at the same time. I think I learn something new about my industry, my business, and myself every time I have the chance to connect over coffee with someone new. The magic of social media is the connections that come from it. When we use Instagram and Facebook how they are meant to be used, these apps work wonders building communities. Instead of focusing on beating the algorithm, log in to find like-minded individuals. Leave a genuine comment on their feed. Start a conversation with them! If you’re in any Facebook groups, post a call for connection—a meetup of sorts. Ask questions and listen to those who respond. 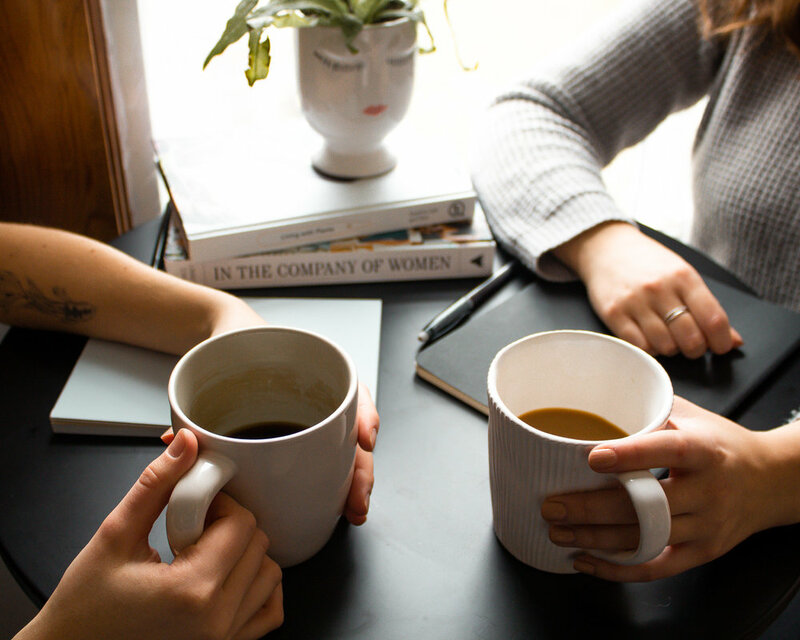 One of them just might be your new #bizbestie. In the name of inspiration, share your favourite biz ladies and bloggers in the comments! Who do we all need to know about? Let’s cheer each other on.